This adaptation is the result of discussions between Yahoo Groups guzzi members. This forum is dedicated to the Scuderia Guzzi Moto Club. 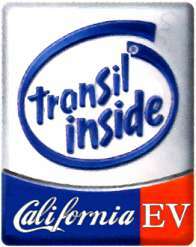 Warning: the following recommendations are for the California EV. For the other models, see at bottom page. In order to insure the ECU protection, the Transil Diod has to be connected between the ground and the + wire which drives the ECU relay, that's to say after the fuse which protects the ECU. Note that the original fuse protecting the ECU has a value of 15A (blue color) ; in order to limit the current in case of overvolting, the value of this fuse has been modified to 10A (red color). Download the reference document related to the Transil Diod 5KP 15A. On the diod, the Cathod is marked with a silver ring ; solder the 2 inches red wire on it. Then on the other side, the Anod, solder the 2 inches black wire ; at the other xtremity of this wire, set the 6mm round pod. Properly insolate the connections with thermoshaft. 2. Unmounting the fuse and relay stands. Unscrew the lateral cover in order to access to the fuses socket. Release the fuse and relay socket (2 screws for allen key 5). Locate the ECU fuse. Warning : on Calif EV, it might be either the 5th or the 6th from the left. 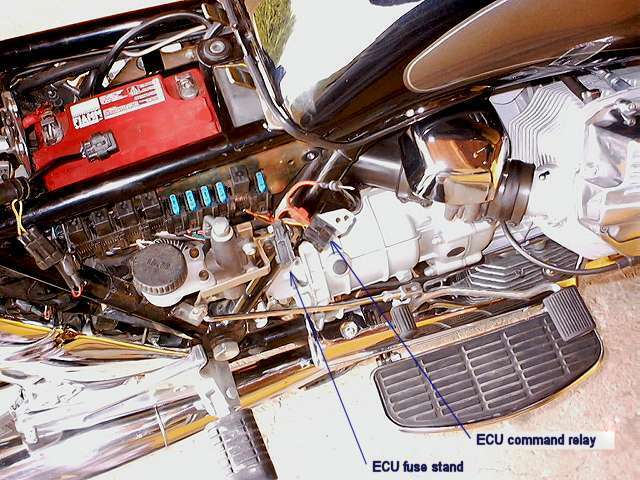 On my Calif EV, the wire between the ECU and the fuse is brown. On others, it can be green / white. Remove it from its stand. Remove the ECU relay from its stand (here also, it might be the 5th or the 6th relay from the left side). Release the relay stand applying a pressure on the small lock lever between these 2 modules and pushing up. Release the 6th fuse stand the same way. 3. Connecting the diod and put all the stuff back. 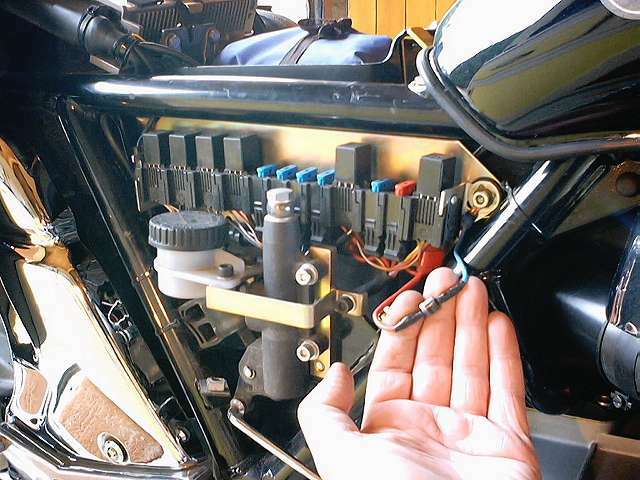 With the clip, connect the diod red wire to the wire between the ECU relay and the ECU fuse. Put back the ECU fuse stand. Put back the ECU relay stand on the ECU fuse stand. Screw the fuse socket with the diod black wire to the ground. Insert a 10A fuse on the ECU fuse stand. New ! Plug and Play protection. Thanks to Jean DAUPHIN !